Crate training your dog is a great way to give your pooch their own special space, and a sense of security. Some owners worry that putting a dog in this relatively confined space is cruel, but provided you properly train your canine companion, and choose an appropriately sized crate, the benefits far outweigh any potential setbacks. Since dogs have an innate instinct to find a den, they tend to take well to crate training, and retreat to their own space when they feel anxious or tired. Dogs who are used to sitting in a crate from time to time will also find travel a lot less stressful – since you can bring the crate along for the ride, your dog will be able to fall back on this familiar setting and be comforted. Dog crates can be a real lifesaver for owners and pets alike, and with so many options about you’re sure to find a crate that’s right for you and your pet. To help you choose, we’ve compiled a list of the best crates available right now. Here you’ll find everything from simple dog cages to more elaborate wooden dog crates, suitable for pooches of all sizes. We’ve also answered some commonly asked questions about pet crates, so you and your pet can use them safely and effectively. The first crate to make it onto our list is this Amazon Basics solution. It comes in a variety of sizes, making it the ideal choice for almost any breed. The single swing-open door offers a large opening that makes for easy and comfortable entry. This opening also makes it easy to clean and arrange bedding. It’s held in place with two slide-bolt latches for a secure fit. The crate is constructed from durable metal wire, lending it strength and rigidity without compromising on ventilation. The open wire design also ensures great visibility for your pooch. The crate also features a useful divider panel, which allows users to adjust the crate’s size to match your puppy as they grow. The crate can also be folded flat in a matter of seconds, without the need for tools. This handy feature makes it really easy to store and transport, and it’s just as effortless to reassemble too. 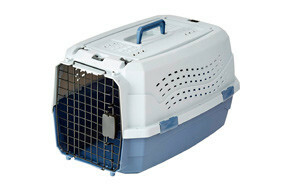 Users say the crate is a great option for both cats and dogs, is easy to set up, and features a secure build. For extra convenience, Amazon also offer a two door version of the crate. Petmate’s Sky Kennel was designed with pet travel specifically in mind. The sturdy plastic shell protects your dog during transit, while its wire vents and door allow for ventilation and visibility. The four-way vault door offers the security you need during travel, and stays in place even on bumpier journeys, keeping pets safely where they should be. To keep pooches comfortable on longer stints, the crate also includes clip-on bowls where food and water can be safely provided. Two ‘Live Animal’ stickers, and one ID sticker are also included. As well as this, the dog travel crate features a useful handle on its top, to facilitate secure and convenient carrying. If your pet needs to travel by air, you’re covered too, since the crate is approved by most airlines. Petmate have over 50 years of experience crafting kennels and crates for our pets, and they have put this expertise to great use making this secure and comfortable travel solution. With their unique fabric design, this Noz2Noz product makes the ideal large dog crate. It features a lightweight steel frame, covered with fabric mesh panels, and can be assembled and collapsed in a matter of seconds for easy transportation. Its rounded corners prevent it from scratching any surfaces, while its wipe-down finish makes for easy cleaning. The breathable fabric makes for great ventilation, keeping pooches cool as they rest. It’s suitable for use both indoors and out, and offers pets protection against rain and sun. Pets can be safely secured inside with a durable zip system and mesh panel, making it suitable for use on the go, too. The crate is available in five different sizes, so is sure to fit your canine companion no matter their size. Customers say the crate is sturdy, easy to assemble, and light enough to transport. The next item to make our list is this heavy duty dog crate by Pro Select. It’s constructed from 20-gauge steel, and reinforced with half inch steel tubes, making it the strongest and sturdiest dog crate on the market right now. Thanks to a removable floor grate tray, it’s easy to clean and maintain, while removable casters that attach to the bottom make for easy mobility. 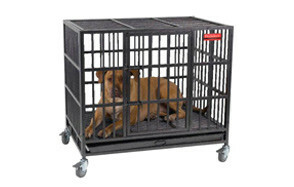 With this crate’s heavy duty design, even the largest and heaviest dogs won’t be able to damage their space. It’s a great option for anxious dogs who may hurt themselves trying to work their way out of a lighter crate, or do damage being left alone in the house. The crate can be securely closed with a simple but sturdy sliding bolt mechanism, and offers dogs a safe, secure space no matter their size and strength. Users say the crate is the toughest around, so if sturdiness is your key requirement in a crate, this could be the option for you. For pets and owners with a stylish bent, Casual Home’s attractive wooden crate could be the perfect option. The crate, available in four different sizes and colors, doubles up as a neat end table, so your pet can sit nearby when you relax together. The variety of colors allow the crate to blend in with most interiors, and it’s easy to assemble in no time. The lockable grate at the crate’s front allows pets to see out, and enables ventilation, while keeping them safely in place. The solid wood construction makes for great durability, and it’s sustainably sourced too for your peace of mind. Because the crate allows less visibility than standard wired designs, it’s not a great option for pooches who aren’t already crate trained. For dogs who’ve been in crates before, though, it provides a cozy and secure space for relaxation and sleep. The next metal dog crate to grab our attention is this simple but effective solution by MidWest Homes for Pets. The crate is available in seven different sizes, making it ideal for every pooch from pugs to great Danes. The crate has not one but two doors, positioned on its front and side. This ensures your pet will be able to easily access their safe space no matter where you position it in the home. Each crate includes a free divider panel, tray, and carrying handle, as well as four roller feet designed to protect your floors. The divider allows you to adjust the crate’s size to fit your needs, so your pet can use it comfortably from puppyhood onwards. The durable design, comprised of metal wire, is strong enough to offer your pet security, without compromising on ventilation and visibility. It’s easy to assemble and collapse without tools, so you can conveniently stow it away when not in use. MidWest have designed the crate to be as safe as possible for humans, too – its patented side clips round out sharp corners and prevent injury should someone walk into it. In their second entry on our list Amazon Basics present this budget-friendly but highly versatile pet crate. The clever top-load design allows pets to be placed in the crate from the top, or to walk in from the front, making it ideal for both providing a safe space for your pooch and transporting them from A to B. The screws included with every crate can be used to further secure the top and bottom, for additional reinforcement that’s perfect for travelling, while the durable plastic of the crate ensure that it lasts and lasts. A wire mesh front door and ventilation holes in the sides of the carrier keep air moving through so your pooch stays cool and comfortable throughout your journey. Securing the front hatch is easy and smooth, thanks to a spring loaded latch system, and owners report that, overall, it provides a safe and comfortable space for pets to relax or travel. The next dog crate to earn itself a spot on our list is Petnation’s collapsible Port-a-Crate design. As its name suggests, the crate is easy to transport, making it the perfect option for pooches on the go. If you take the dog on the road with you during RV or camping trips, this could well be the perfect solution for you. It’s made from lightweight but durable polyester, which can be assembled or folded away in mere seconds. The crate is versatile enough for both indoor and outdoor use, thanks to the durability of the fabric and steel frame. On its sides, honeycomb mesh windows encourage ventilation, so your canine companion is sure to stay cool. It also features two doors, allowing pooches to move in and out with zero hassle. The crate is also easy to clean, thanks to its wipe-down fabric, and features two handy storage pockets on its back, making it easy to keep a bottle of water and snacks at hand during your travels. Smonter’s durable dog crate is the second heavy duty option to make our list – and for good reason. It’s made from a heavy duty steel frame, and equipped with super-strong latches, ensuring that even the heaviest and wiliest dogs are kept safe inside. It’s easy to assemble, using only a screwdriver, and features four wheels for quick and easy transportation to wherever you need it. The crate also features a detachable tray for quick and easy cleaning, and stands up against rust and other corrosion for a long, useful lifetime. Overall, this solid option provides a sturdy, safe, and comfortable space for stronger dogs to feel secure and relax. Because of its weight, it’s not a great option for transportation, but around the house it can be the safe space that more anxious dogs need. Last, but not least, is Merry Pet’s two-in-one pet crate. This clever crate offers pets not only a secure and cosy space to relax, but can also be unfolded to create a pet handy pet gate for your home. This function is ideal if you need to keep pets in one part of your home, and could also work well for keeping dogs away from the driver in smaller RVs. Its frame is made from MDF with a solid wood veneer, for a lightweight but attractive finish. Metal bars comprise the rest of the crate, allowing your pooch to see what’s happening around them, and feel the benefit of good ventilation. The crate takes just a few minutes to put together, and is made to a high standard of quality. When in crate mode, it even doubles up as an attractive end table, adding yet another function to its repertoire. Be warned, though – this design isn’t suitable for anxious dogs and chewing puppies, who will likely be able to escape, and chew away the wood veneer. Despite this, the versatile and stylish design is a great addition to any space where calm pooches reside. Whether you’re shopping for a small dog crate or something large and heavy duty, we’re confident out list has you covered. To help you choose the crate that best meets the needs of you and your dog, we’ve compiled this handy buying guide below. Here, we discuss what you should bear in mind when purchasing a dog crate, how to choose the correct size for your pooch, tips for crate training a dog, and more. 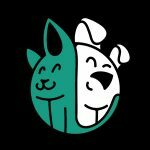 By answering some commonly asked questions about these products, we hope to offer the guidance that you and your pet need to get the most out of whichever option you choose. First and foremost, it’s important to consider the size of your dog when purchasing your crate. We’ll discuss this in more detail later, but it bears repeating here - measure your dog and ensure the crate is large enough to accommodate them before you make a final decision. The next thing to bear in mind when buying a dog crate is what construction material you want. There are a few different crate materials to choose from: wire mesh, fabric, heavy duty steel, plastic, and wood. We’ll discuss the pros and cons of each in more detail later on. The next factor to bear in mind when choosing a dog crate is how easy it will be to transport. If you need to use the crate on the go, consider a plastic or fabric option, and look out for a collapsible, lightweight design, and carry handles. Most owners keep their dog’s crate in the home, so its appearance can be quite important. If you want to place the crate in your living area, consider a wooden design that doubles up as an end table, such as options five or 10 on our list. Another important factor to bear in mind when choosing a dog crate is how well it’ll contain your dog. Unless your dog is destructive or anxious, this will be more of an issue for travel crates than one designed for use in the home. The strongest crates tend to be the heavy duty steel designs, which often feature especially strong latch bolts. For travelling, plastic crates tend to offer the best security. Finally, as with any purchase, you’ll need to bear in mind what budget you’re working with. Luckily, a good quality wire dog crate can be had for as little as $30, although wooden and heavy duty steel options will set you back considerably more, with prices for the latter ranging from $300 to $1,000. Using a crate replicates wild dogs’ natural behaviour: they sleep in cozy dens for up to 16 hours a day! Metal wire is the most common material for pet crates to be made from. 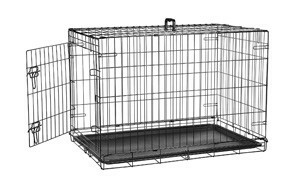 Wire crates are cost-effective, sturdy, and provide your pet with plenty of ventilation and great visibility. They often come with a carry handle too, for easy transportation. Bear in mind that this type of cage might not be tough enough for particularly wiley pets, and doesn't blend in well with home interiors compared to other materials on the market. For strong heavy dogs, or pooches who are known escape artists, a crate constructed from heavy duty steel could be the best solution. These dog crates tend to be heavy, and can be difficult to move, but many are equipped with small wheels at each corner to make things easier. They also tend to be the most expensive options, because of the high quality material. These crates tend to be the most lightweight options, making them ideal for RVs, camping, and dogs on the go in general. The fabric often features mesh ‘windows’ so your canine companion can see out and keep cool. They’re easy to collapse and assemble, too. Many fabrics are easier to clean than wire frame options, because of their wipe-down fabric, and they’re often suitable for both inside and outside use. Wooden crates are another option you might choose. They’re designed to look attractive and blend in with the other furniture in your home, but don’t tend to be very portable and can be pricey if you choose one made from solid wood. Most plastic crates are designed for travelling. Plastic is lightweight and rigid, making it perfect for this purpose. Plastic crates tend to be equipped with a carry handle and ventilation holes on the side. They’re perhaps the least attractive option, and don’t tend to be large enough for everyday use in the home. Q: What is a crate for a dog? A: Dog crates, sometimes referred to as dog cages, provide a safe and secure space for your pet. They emulate the dens that dogs frequently occupy in the wild, and with proper training they can provide a peaceful haven for pets. As mentioned earlier, they can be made from a wide range of materials, and in a variety of designs. Crates can be used in isolation, or in combination with dog kennels for outdoor use. How well your dog takes to a crate will depend on their age and temperament, so it’s a good idea to introduce them to the crate gradually - especially if you only begin crate training them as an adult. Q: How big of a crate do I need for my dog? Dogs between 1 and 10 pounds - Breeds including chiuauas, jack russell terriers, and pugs. Expect to buy a crate measuring roughly 24 x 18 x 21 inches. Dogs between 11 and 25 pounds - Breeds such as Boston terriers, miniature Dachshunds, and Maltese. Expect to buy a crate measuring roughly 24 x 18 x 21 inches. Dogs between 26 and 40 pounds - Breeds such as cocker spaniels, American pitbulls, and Welsh terriers. Expect to buy a crate measuring roughly 30 x 21 x 24 inches. Dogs between 41 and 70 pounds - Breeds including basset hounds, English setters, and Schnauzers. Expect to buy a crate measuring roughly 36 x 24 x 27 inches. Dogs between 71 and 90 pounds - Breeds such as Australian Shepherd, Border Collie, Boxer, Chow-Chow, and Dalmations. Expect to buy a crate measuring roughly 42 x 28 x 31 inches. Dogs weighing more than 90 pounds - Breeds including Bernese Mountain Dogs, Bloodhounds, Giant Schnauzers, and Great Danes. You’ll need a crate measuring around 46 x 30 x 33 inches. The golden rule when choosing a crate for your dog is to find one that’s not too big and not too small. Too big, and your pooch might be tempted to go to the toilet at one end rather than asking to be let out; too small, and they could end up cramped and uncomfortable. If you’re buying a crate for a puppy, it’s a good idea to select one with a moveable panel, which allows you to adjust the size as they grow. Q: How do I measure a dog for a crate? A: The first thing you need to do is take a tape measure, and measure the length of your dog from nose to tail. Add 2 - 4 inches to this length and make a note of it. Next, measure your dog’s height, from the top of their head to the floor, and make a note of this too. Finally, to determine the width you require, add 2 - 4 inches to the height measurement you have just taken. You should end up with 3 measurements, which can then be compared against manufacturer’s descriptions. Use the rough guide above to work out what dimensions you’re likely to need. Q: Where is the best place to put a dog crate? A: The great thing about dog crates is that you can move them around, so you don’t need to make any final decision when it comes to placing them. During the day, it’s usually best to place the crate in the busiest room of your home - most likely the kitchen or living room. Dogs are highly social animals, and like to see what’s going on even when they’re resting. Including the crate in a busy area means your dog feels included even when they’re in their own space. Placing the crate in a quieter area could lead to your dog feeling isolated, and seeing the crate as a punishment. For new puppies, it’s best to place the crate in your bedroom at night. Being able to see, hear and smell you at night will ease your puppy’s transition from sleeping alongside their littermates to sleeping alone. If your new dog will always sleep in your room, it’s fine to leave the crate here, but you could also move it to its daytime spot after a week or so. For adult dogs, place the crate in their final sleeping spot straight away. Wherever you put the crate, ensure it’s at a comfortable temperature. Avoid placing it near radiators or in drafty spots. Q: How do I get my dog to stop whining in his crate? A: If your dog is new to crate training, they may cry or whine when you first introduce them. It can be hard to hear, but with time and proper training your pooch will learn to regard the crate as a safe space and no longer feel the need to whine. Feed your dog in their crate at first, to create positive associations. Make the crate a comfortable space, by introducing bedding and toys. Puzzles that double up as treat dispensers, such as a Kong, along with chew toys, can keep dogs entertained for hours. Being entertained in their crate will also solidify positive associations. Keep your dog in their crate from time to time while you’re at home, as well as putting them inside when you’re away. This ensures they don’t associate the crate itself with being alone, which significantly reduces their anxiety at being inside it. Be sure not to reward whining behavior with attention, but do check if your dog is whining because they need to go to the toilet. If they continue to whine for several minutes, say the phrase they associate with going outside, and see if they respond. If they do, take them outside briskly before returning them to the crate. Do not yell at your dog or bang on the crate - this will only increase their anxiety. Q: How long can I leave my dog in a crate? A: Leave your dog in their crate for progressively longer stretches of time. Building up gradually will keep your pet’s stress levels to a minimum. Puppies shouldn’t be kept in their crate for more than a few hours at a time, while adult dogs who are used to it can sit comfortably in their crate for up to eight hours or so. As long as the dog has adequate exercise and attention every day, leaving them in the crate for the length of a standard work day should be no problem. These 10 options are the best dog crates around. Of these products, our top pick has to be Amazon Basics’ durable and affordable folding metal crate. Available with either one or two doors, and in six different sizes, Amazon have taken into account pooches of every shape and size. The manufacturers even offer an optional divider panel that lets you adjust the size of the crate as your puppy grows. The two slide-bolt door latches ensure your pet is held securely when required, while the sturdy wire mesh design offers a safe and durable space for them to call their own. The crate is convenient to use and store too, folding flat in a matter of minutes for storage, and featuring a well-placed carry handle for easy transportation. On the crate’s bottom is a detachable plastic tray, which prevents any dirt your dog tracks in from making it onto the carpet, and can be easily removed for fast and convenient cleaning. Overall, this versatile crate is a great option for the majority of dogs and owners; it offers pets a safe, sturdy space, and owners a convenient, long-lasting crating solution.